What was once fodder for sci-fi films are now crucial for any business's success— yes, any business. When used correctly, data & AI are powerful tools that can propel your business forward. When they're not? Things (like your ROI) can fall pretty flat. 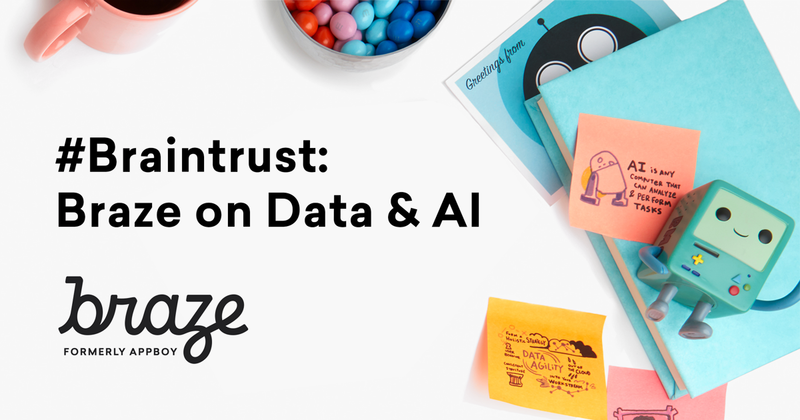 Learn the ins, outs, and a few in-betweens of how your data & AI can elevate your team's efforts. Start exploring— you might even have a little fun along the way 😉 . Not Hype, Not Magic: What Human-Focused AI Really Means For Customer Engagement: Find out what it takes to get ready to take advantage of AI effectively as part of your marketing and growth strategy. Marketing at the Speed of Instinct: When it comes to marketing, go with your gut—but use testing and data to see how your gut instincts perform. Choose Your Own Mobile Marketing Adventure: The Automation Difference: See how basing engagement decisions on user behavior can lead to big results and stronger customer relationships with this exclusive interactive experience. What’s Your Data Style? : Get new insights into how you think about data—and what it means for your customer engagement efforts—with this simple quiz! Why Braze Built an Intelligence Suite—And Where We’re Taking It: Learn why having the right tools to send the right message at the right time are key for your business and how the Braze Intelligence Suite can help make that happen. Ecosystem vs. Ecosystem: Dig into the similarities (and key differences) between natural ecosystems and modern tech ecosystems with this eye-opening interactive infographic.